Is a school and a center for art in St. George, Utah. 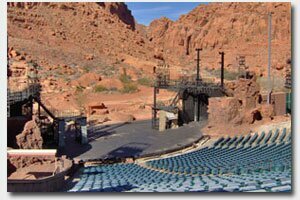 Tuacahn is southern Utah's place for plays and cultural events attracting people from all over the state including Cedar City and Northern Utah. In addition, Tuacahn has been known to attract tourists and residents alike visting the Zion National Park area and Mesquite and Las Vegas Nevada. Try to Tuacahn in the summer months for a variety of plays like: The Nutcracker, The Halloween play Thriller is a popular event in the winter months along with Christmas events on a regular basis. The mission of Tuacahn High School for the Performing Arts and Technology is to enlighten minds, inspire talent, develop abilities, promote character and preserve values, while training and encouraging students to meet the creative and intellectual challenges of the 21st century. Tuacahn High School provides an innovative and dynamic environment where all students are given the opportunity to succeed and excel in academics, technology, and the performing arts. Tuacahn was started in 1993 and the $23 million facility was completed in 1995. They started with shows like UTAH!, Seven Brothers for Seven Brides, Annie Get Your Gun and Joseph and the Amazing Technicolor Dreamcoat. Every year their shows provide world class entertainment for the locals and visitors from around the world. They actors and actresses are from all walks of life, from children to experienced veterans of the stage! At Tuacahn you can expect the best and return time and time again. Drive North 3.6 miles on Bluff Street to Snow Canyon Parkway. Turn Left (West) on Snow Canyon Parkway toward Ivins, continue 4 miles. Turn Right (North) 1130 East towards Snow Canyon State Park. Immediately take the first left, which will take you to Tuacahn. Drive West 2 miles on St. George Boulevard to Bluff Street. Turn Right (North) on Bluff Street, continue for 1.7 Miles. Turn West on Snow Canyon Parkway toward Ivins, continue 4 miles.